At TransIP you have the freedom to choose one of the Operating Systems that you want to use on your server. This is one reason your VPS is provided as an 'unmanaged' service where you have complete freedom in choosing your configuration. Should you skip this step during the initial purchase, you can always do this at a later date. You can also always perform a new installation (either the same or another OS) which will overwrite the currently installed OS. You're free to (re)install your OS at any time by following the steps below. In the top right, click on 'Manage', followed by 'Reinstall OS'. When performing a reinstall the current data on the VPS will be overwritten. Please take this under consideration when reinstalling and create a back-up of the data on the VPS if you want to save this! You keep your VPS' IP addresses after a reinstall. Any additional IP addresses will need to be reconfigured after the reinstallation. 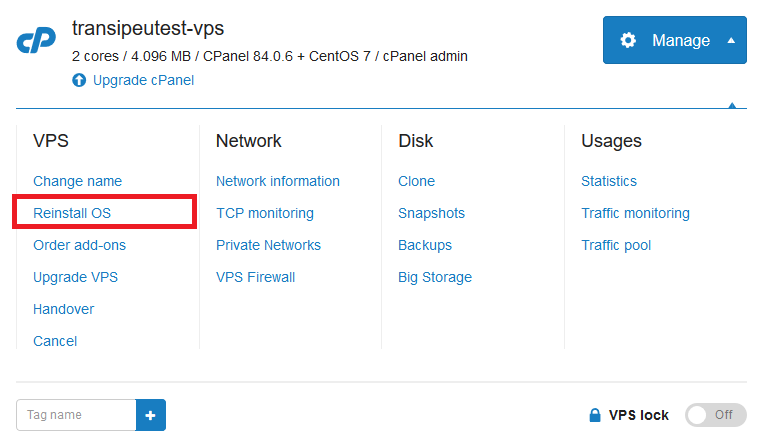 When the installation is complete, you can login on your VPS via the console. Generally speaking a (re)install will not take longer than 5 minutes, with the exception of Windows Server (which takes up to 30 minutes). When selecting a 'standalone' OS such as Ubuntu, CentOS or FreeBSD, you will need to finish the configuration of the OS via the console. This is also where you choose the (root) password for your OS. The exception to this are the 'web control panels' (DirectAdmin, Plesk & cPanel). For these installs you will receive a mail from us containing the necessary credentials. 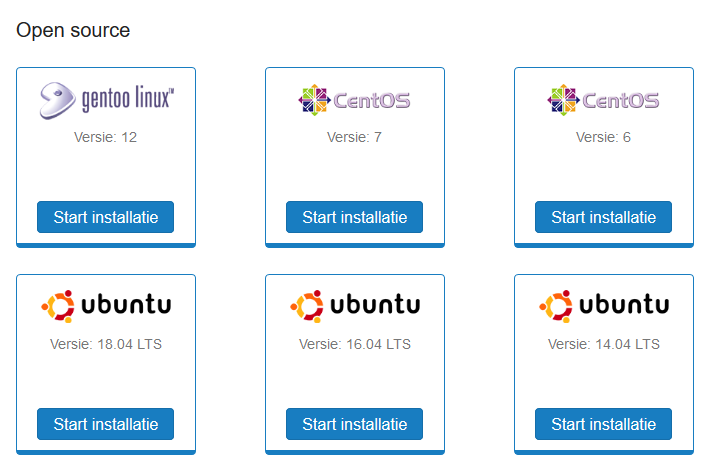 Are you reinstalling a VPS that used to have a control panel with a standalone OS such as Ubuntu? Your control panel license will then automatically be cancelled. it is advisable to use an external connection / management tool (for example SSH or RDP) for the daily management of the VPS, although the console is always available to use for this purpose.